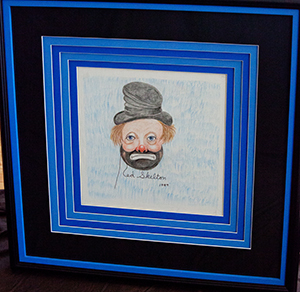 “Freddie The Freeloader” is an original one-of-a-kind mixed media drawing on linen hand signed by the internationally acclaimed artist, Red Skelton, who dated this wonderful work of art “1989.” “Freddie The Freeloader” was an immensely popular fictional character created by Mr. Skelton and was seen on national television for almost twenty years. Collectors will remember “Freddie The Freeloader” as a kind and lovable individual who gave thanks for his life and health while living in the city dump. “Freddie The Freeloader” was always helping sick children and men and women in poverty and visiting local hospitals to cheer the patients. This work of art measures 14” x 14” and has been beautifully framed using the highest standards of museum-quality materials.